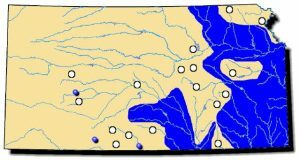 This species ranges throughout the Mississippian Region; Great Lakes into western New York state, west to Minnesota, southern Canada; Peninsular Florida; Apalachicolan region; Gulf Coastal region west to the Rio Grande system in Texas. Although considered stable throughout much of its range, it is rare in Canada (only a few records from Ontario remain), but has recently expanded above St. Anthony Falls on the Mississippi River drainage in Minnesota. Comments: Even as an adult, the lilliput is an apt name because this mussel is one of the smallest in the family (Unionidae). The outermost layer of the dark brown shell has a cloth-like texture feeling like wet leather. Inside the shell, the nacre is bluish-white. 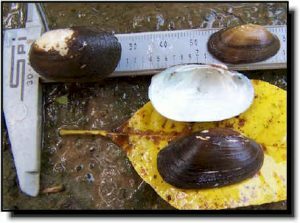 It can be confused with the pond mussel, however, unlike the inverted Vs of the pond mussel, the lilliput has concentric lines near the umbo. The female has a distinctive lure which resembles two creamy white worms extending from the shell, and can move these lures to entice a host fish. It is most often found in ponds or lakes but can be found near pool margins of fast-flowing streams.